Sign up here for email news & gig notification etc. Dec 23rd Can't hear sound on this page? Dec 21st Some gigs for 2007 added. Dec 15th De Jessa Page updated. Updated: The Deans new url address. Henry McCullough for Nov 29th. Corbett's gig Dundalk, Oct 28th. (i) A Zen Alligators post card. (ii) Steve in the studio with the Deans. July 27th New Gigs :Cobh, Wexford & Dublin. July 7th Gigs updated Grange August 4th. June 25th Wexford date now Sat July 8th. May 20th Gigs updated Enniscorty June 4th. May 5th Gigs updated Tullamore May 12th. April 29th Gigs updated Crusheen May 21st 5pm. April 21st Gigs updated - Cobblestone - June. April 1st Gigs updated - Cobh date for April. March 25th Johnny on TG4's Adran with Horslips. rescheduled due to a diary date clash. Feb 19th Updated Gigs page - March gigs added. Jan 15th Links updated to add The Deans Band . downloadable for our site visitors. from here, and HAPPY NEW YEAR!! Dec 29th Initial 2006 Gigs list released. 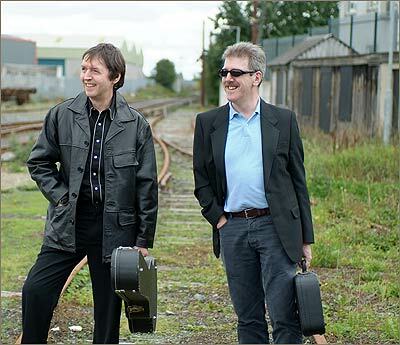 Although the pair mostly play as a Duo, you will find them joined occasionally by other musician friends including Mick Rowley.